This famous cape starts at the bay of La Garoupe and ends in Juan-les-Pins. 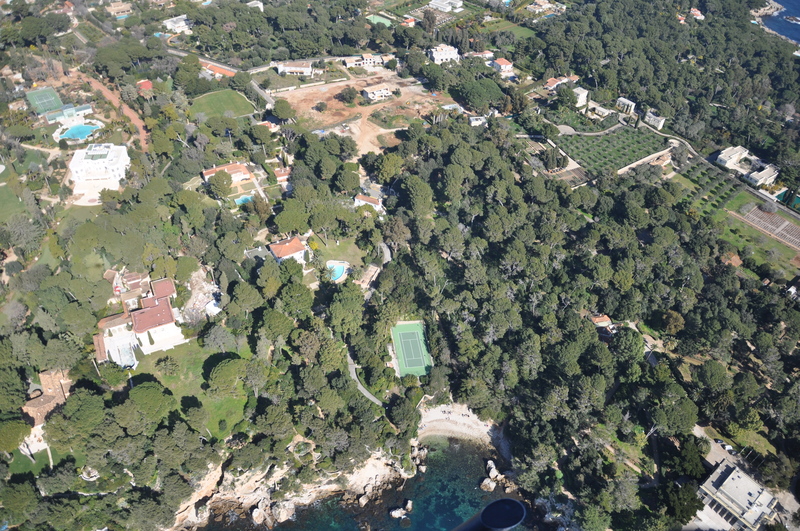 Only slightly behind that of Cap Ferrat, its property market undergoes the occasional change, but never slows down. It’s hard to imagine that in place and stead of this Garden of Eden, rock once reigned supreme. “In the late 19th century, James Wyllie brought in the soil that was to create the foundations for the cultivation of roses. Meilland, Leonetti, Astoux and Richardier shared the land. It was then that the first mansions were built, by the British who came for holidays. The Hôtel du Cap Eden Roc, considered as one of the loveliest in the world, opened its doors in 1870. Fifteen years previously, the botanist Thuret had introduced plants, hitherto unknown, onto the cape, such as palm-trees and eucalyptus. Antibes pursued its development and the port became a popular venue for sailing enthusiasts. Juan-les-Pins came into its own as of 1920, intensifying its development from 1950 to 1960. These were the days of jazz and American visitors. Today, Cap d’Antibes functions rather like a village with its own shops and school : it is home to four to five thousand villas, very often solely used as holiday homes”. One local agent from Agence du Cap d’Antibes notes the arrival of clients reluctant to pay the high prices on Cap Ferrat. In Antibes, purchasers are very demanding and, under the pressure of demand, quality homes are beginning to prove scarce. Prices start at 1 million €, which will buy a small house with a small garden, no view and no pool. Average transactions swing from 1.5 to 3 million € giving living space of 150-250 sqm (4 bedrooms) in grounds of 1,500-2,000 sqm with a glimpse of the Med. The top end of the market ranges from 20 to 30 million €, and even higher, bringing a park of 2.5 to 5 acres with swimming pool and tennis court. Really sumptuous properties include the Château de la Garoupe with its 32.5-acre park, the Villa Aujourd’hui, built by Mallet-Stevens for John Warner, and the Château de la Croë, formerly owned by Prince Edward VII and Onassis. While residents on Cap Ferrat enjoy the proximity to Monaco, those on Cap d’Antibes appreciate being halfway between Cannes and the International airport in Nice. They are mostly European, Anglo-Saxons, from the eastern bloc, Brazil or Argentina. They prefer the west side of the peninsula to the east. They dream of Millionaires’ Bay, to the south, but soon realise that few properties come up for sale. Finally, they are quite prepared to take on renovation work. Speculation is still possible and property dealers are always hunting around. One example is a house of 160 sqm in grounds of 1,300 sqm in the Parc Saramartel priced at 2.4 million €, which has benefitted from successful renovation. Building land is even rarer.One mentions a plot of 2,000 sqm, offered at 1.2 million €. Apartment blocks are few and far between, probably due to dissuasive measures laid down in the Land Use Plan. On a plot of over 1,500 sqm, living space can only equal 10 % of the total premises, and the height of the building is restricted to 7 metres. Aurélia Roc, Le Château de la Pinède and Port Galice. Expect to pay at least 12,000 €/sqm for an apartment on a high floor with sea view. At the moment, Port Gallice, for example, has a 1-bedroomed flat of 83 sqm for sale at 950,000 €. Finally, seasonal rentals are a source of income which is not to be overlooked. In fact, potential buyers always ask about a property’s rental value. “Renting a property enables owners to cover their costs of up-keep and even make considerable profits,”. The occupancy rate is close to 50 % in July.